When I received Rowan’s new Thick ‘n’ Thin yarn I couldn’t wait to start knitting with it even though I already had several unfinished projects on the go. I also received the Thick ‘n’ Thin pattern book and looking through the 15 designs I was immediately drawn to two: Umbra and Corona. I really didn’t know which one to knit first but finally decided on Umbra because of the loopy shawl collar. 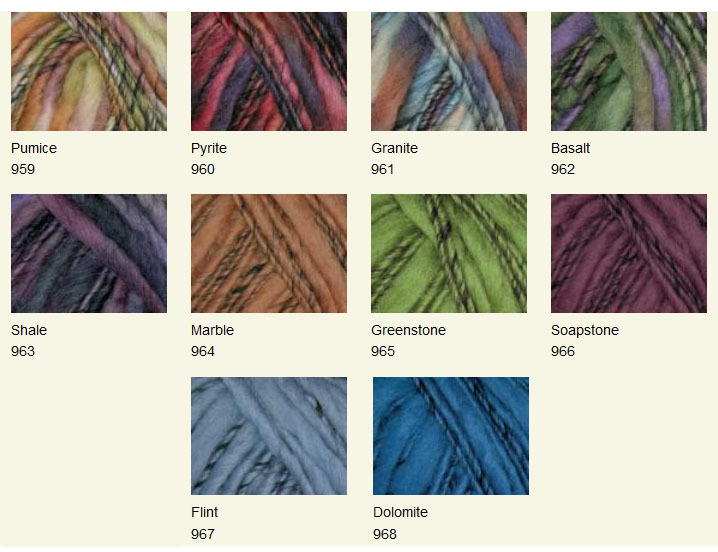 Then I had to decide which colour: Shale (the purple/blue one), Dolomite (the blue one) or Pyrite (the red/pink one). As I have too many blue and purple knits I decided to go with Pyrite and I’m so pleased that I did. I really love my finished Umbra! Everyone loves the loopy collar and I even get compliments from strangers asking me where I bought it! You will see that I have altered Umbra from the original design as I prefer more fitted clothes. 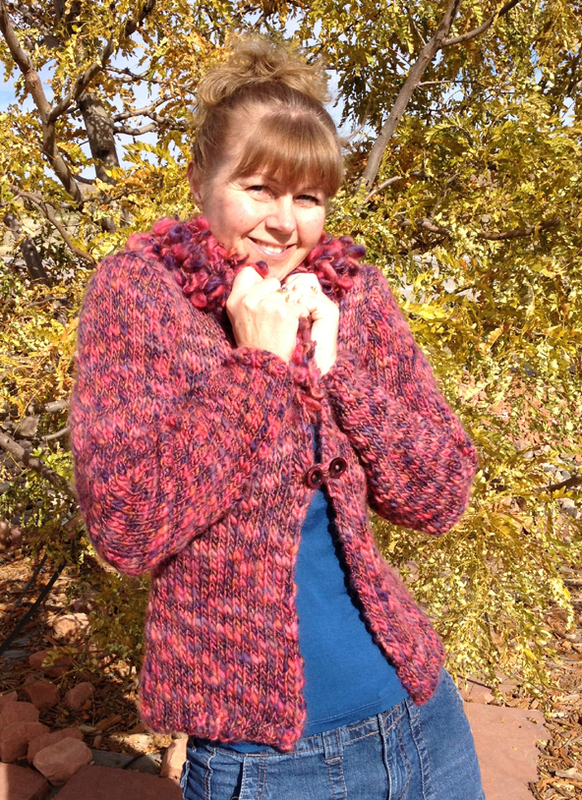 As my bust measures 37″ and my waist 24″ I knew the position of the one button fastening on Umbra would make the cardigan pull awkwardly just above the fullest point of my bust and then hang down and out like a smock! So I decided to omit the buttonhole and make an edge to edge design with a button fastening just under the bust. 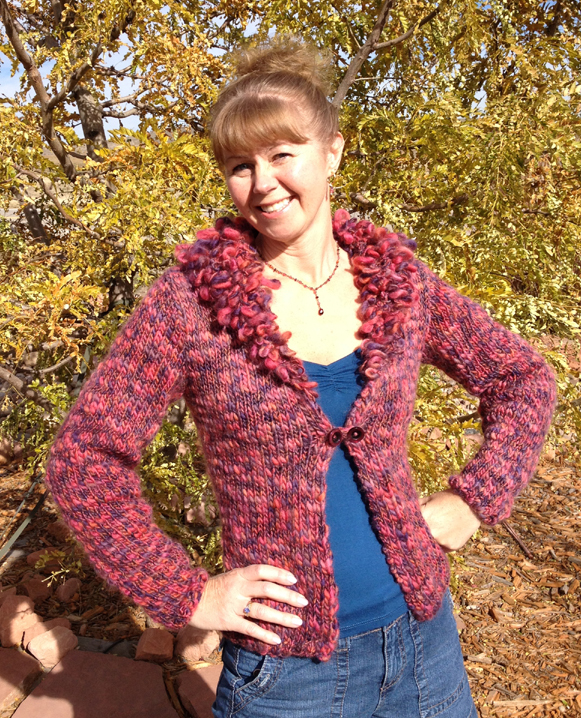 I added two buttons, both with a crochet loop attached on the reverse side. To fasten, you loop the loops over the opposite button but first thread one loop through the other so you get an even join (see pictures below). I also wanted to make it longer and fitted at the waist. I did this by working out how long I wanted the finshed cardigan to be and compared this to the length of the actual cardigan which appeared to fall on my waistline. So, using the tension as a guide, I estimated the number of rows I would need to add to reach the desired length and the number of stitches I would need to decrease as I knitted towards my waistline and then increase again as I knitted towards my bust and over how many rows. Lots of measuring and maths is required here! I’m really happy with the results; it all worked out great! The one thing that I didn’t like was the yarn pooled. This is not surprising in reality as the yarn consists of several inches of thick yarn followed by several inches of thin yarn. This is repeated consistently along the length of the yarn. Pooling will occur if the thick part of the yarn is repeatedly knitted over the same stitches on a series of following rows. This meant the same thing happened with the thin part of the yarn; thin yarn is repeatedly knitted on the same stitches on a series of following rows. The result was areas of thick bulbous fabric surrounded by thin fabric (see picture below). This happened to me around the back waist area which caused the garment to look misshapen as it appeared bulbous in the thick areas and flat in the thin. I ripped it back, which thankfully is easy to do with this yarn, and re-knitted this section making sure the thick part of the yarn was never repeatedly knitted over thick yarn by cutting away the thick part of the yarn and rejoining it at a thin section. Basically, I tried to make sure thick yarn was knitted over thin yarn and vice versa. This was pretty easy to do as the thick and thin lengths of yarn measured the same. I used this ‘waste’ yarn to sew the cardigan together. However, don’t let this put you off the yarn; this problem is very easy to deal with and can happen with many yarns like this or yarns that have sequins or some form of regular variation along their length. 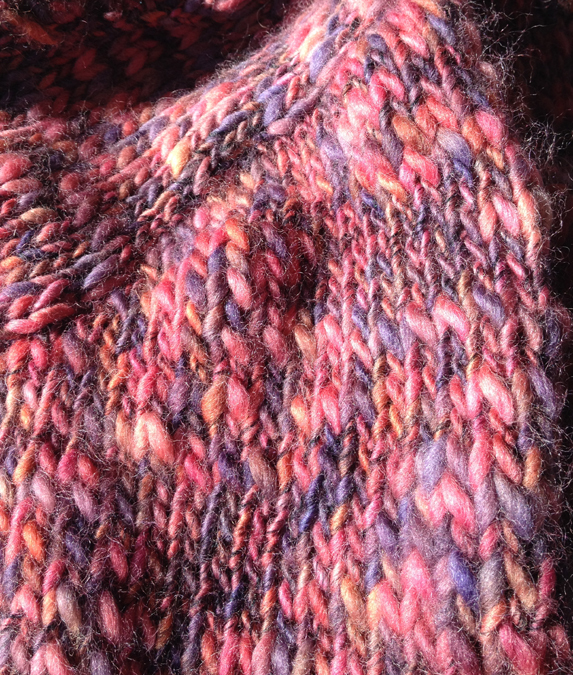 However, maybe you don’t see this as a problem and love the way the texture of the yarn changes as you knit. If so, then just knit and let the yarn create it’s own special texture. Overall, I did enjoy knitting with the Thick ‘n’ Thin yarn because it knits up really quickly on size 9 mm (US 13) knitting needles. It gives the knitted fabric a unique textured finish and even though it is made from 100% wool it is soft and wearable next to the skin. 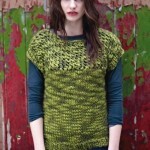 I would now love to knit Corona now but I also like the look of Solstice and Nebula! Altogether, the Thick ‘n’ Thin booklet consists of 15 garments and accessories all by one of my favourite designers, Sarah Hatton. The collection is great for beginners and experienced knitters alike as there are quick to knit hats but also simple and textured sweaters and cardigans.Thick ‘n’ Thin definitely has something for everyone. The Thick ‘n’ Thin yarn comes in 10 shades: 5 solid shades and 5 variegated but all with a dark thread running around and along the yarn. There are not many that i would not use! I would love to know if you have tried knitting with Thick ‘n’ Thin and if you have knitted up any of the designs in the accompanying pattern book. What did you think? Or maybe you haven’t heard of this yarn yet? Click on the links below which will take you to the Rowan website to see all the designs in this collection and then let me know which one you would like to knit and in which shade by leaving me a reply below. (If you cannot see a ‘reply’ box below, click here, when the new page opens scroll to the bottom). Thanks for reading my blog. If If you would like to subscribe please click here.